DOUG QUINT: Would I go to the Guy Fieri Roadshow? Sure. I didn't put Guy Fieri's name with his face until I Googled him. After discovering that he's "the diners and dives guy" I was quite pleased. I like dives; I'll eat at a place just because it looks shockingly seedy. I summed Guy Fieri up as a good-natured doofus who likes greasy-spoons, and that seemed damned OK to me. I tried to learn a little about him before Tuesday night's concert (?) but decided to remain unenlightened. His interviews about the concert (?) made little sense to me: "It's kind of part demonstration, part rock 'n' roll, part comedy hour, it's entertainment, it's fun, it's food; it's food-centric." Guy Fieri (née Ferry), just give me a good show in Lowell. I know Lowell because I pass it every time I drive from New York to my birthstate, Maine. This is the kind of small American city that used to be someplace but now is merely a confluence of highways — making it a fitting place to launch a roadshow. BRYAN PETROFF: The day began fittingly– we researched places he'd featured on Diners, Drive-Ins and Dives and found O'Rourke's Diner in Middletown, CT, perfectly situated at the halfway point of our road trip. Newly rebuilt after a fire, it wasn't even close to a dive. As far as diners go was one of the more upscale ones we've visited. Heavy on eggs and omelettes, only open until 3pm (except 4AM! on weekends). The food was good, worth revisiting if ever in the area. None of the fried stuff (onion rings, fish and chips, chicken cutlet) was overly greasy, though everything needed a few dashes of salt. Was the day going to be different than expected? Dare I say, more "upscale"? If I was in for a full-blown cooking show I would've been happy. If I was in for a full-blown culture clash freakout even better! We aren't ones to shy away from kitsch, irony, low-brow, white trash, anything. We've been to monster truck rallies, group parties at Hooters. We've eaten frickles, a Fishamajig, and a pig's foot with a metal tag still on it. We were up for the challenge and actually hoping the night would freak us out. Little did we know it would end up being just a big fizzle. BRYAN: There were other fans there as early as we were. We helped them take photos in front of the buses and then hit the pubs. We knocked back beers at two pubs before the show, ultimately seeing everyone from those pubs in the audience. When you end up being able to pick out who you just drank next to in a sea of people, you know the crowd is way too small. I was starting to feel embarrassed for him just reading your article. What a trainwreck! I don't know how he can face yet another chili-cheese-deep-fried-taco-bacon-buttered au jus concoction on his show. We went to the show in Wallingford CT last night, and thought it was great! It was a unique show...not too much cooking...but a fun night. I wasn't expecting just a "cooking" show, that's not how it was billed anyway. Everyone around me seemed to have a great time as well, maybe they worked out some kinks. Great reporting! I hope EMD uses these guys more often. Can't stand Guy Fieri and not unhappy that his road show is tanking. Hey people - don't feel embarrased if you weren't there. The show was awesome and these dudes are TOTALLY off. It wasn't quite when Schlow was up there, no one left early and every had a great time. Bryan + Doug...not cool reporting all around. I was in lowell also and it was awesome!!!! "by the way... i was one of those GIRLS that got up on stage to sing." Bryan and Doug lets see you get up there infront of all of those people and do it. the nerves get the voice!!! I dont think it was a train wreck, i think it was a new kind of entertainment for culinary!! keep rocking it GUY!!! I went to the Atlanta show and the writer is DEAD ON. This show was embarrassingly awful. We left early, even though we were given the tickets for free. I'm sure some people were having a good time-- just not people I would ever want to spend time with. Worst. Show. Ever. If I ever see Fieri on the street, I will punch him for wasting 3 hrs. of my life. Boy I wish I'd read this blog before going to the Atlanta show last night. My wife and I both enjoy Guy's shows on the food network. He's a charismatic guy, and so we figured this would be pretty good. Boy were we wrong! The show started at 8:00 and ended at 11:30. Those were absolutely the most excruciating 3 and a half hours of my life! I'm still completely bewildered by the whole experience, and your blog is spot on. Just be thankful your karaoke contest only had 3 contestants. Ours had 7!!! Which lasted almost an hour. If I want to hear bad karaoke (which I don't), I can drive down the street from my house! The whole thing felt like a bad skit put together at the last minute by some 13 year old boys. Except they charged 55 bucks and it lasted 3 hours!! Completely pointless and juvenile. I want my money and those hours of my life back! It's clear after this experience that Guy has an enormous ego...something that hadn't really come across in his network shows. It's as if he's always really just wanted to be a rock star, so he orchestrated this whole debacle to make himself feel like one. I don't think I'll be able to tune into his shows anymore after seeing this...it was that repulsive. It was torture. OH NO, Previous Post. His enormous ego shines fully through all his shows,especially "Triple D" as he calls it. He seems like an alright guy, and I LOVE diners, but if you pay any attention to his attitude on the show, yeah, the ego comes out. At any rate, I do applaud him for this interesting concept. Maybe there should have been some more conceptualizing prior to it's release, but it is definatly a landmark idea. Nothing like this has never been done on this scale it's a lot like Emeril Live by what I've read, but on a much larger plane. I hope that they can fix the issues and bring this revolutionary idea into better light. Oh Lord, Im scared now. I am going to the KC show tomorrow nite and I hate loving someone on TV and them seeing them in concert or meeting them, and have my love of them tarnished. I hope it is good. Keep your fingers crossed for me. i saw the show last night in council bluffs, iowa. they're halfway through their tour. 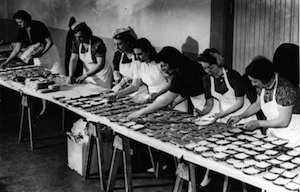 while it's still very much NOT a coking show, things have improved considerably since the first performance reviewed here. there are no longer any microphone problems and you can hear every word woody says. whether or not that's an improvement, i don't know. i mean, essentially this is a guy mixing drinks on stage for twenty minutes. the novelty wears off after about a minute or so. he did get the crowd pretty energized, which is more than can be said for the opening act, two executive chefs from the local venue, a casino hotel. like watching paint dry. not entirely their fault, of course. if you only allow overhead camera shots for the star performer (fieri), any cooking (or mixology) demo is going to fall flat. guy is a good showman and can rally a crowd, but for all his energy, he is not a very good storyteller. this event desperately needs a qualified stage director to set things right and provide some shape and form to the evening; they need somebody to edit the show, provide some discipline and say "no." the thing started at 8 PM and wasn't over till 11:15.
the 25-gallon margarita (seems a wee bit redundant after we just watched a guy mix drinks for 20 minutes) and the karaoke contest are still the main set pieces in the show. they both go on far too long. guy still cooks the hong kong noodles and the pork sandwich, but i honestly have very little idea how he made it or what's in it. the cooking is truly incidental in this "show." 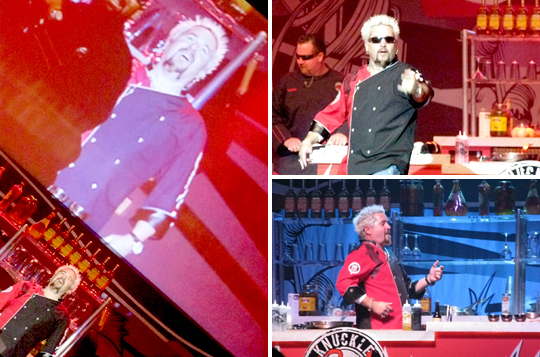 "guy fieri's road show" is much better than "emeril's cooking challenge," which i was unfortunate enough to witness in its premiere engagement in atlantic city last month. the biggest problem with "emeril's cooking challenge" was emeril, who appeared frequently in canned video clips that had nothing to do with the action onstage. at least here you have the man himself onstage and he's an entertaining guy, to a degree... he just doesn't have a show to back him up. there's nothing very interesting or dramatic happening onstage. unless you're participating in a master class, cooking, it turns out, is actually better on TV. 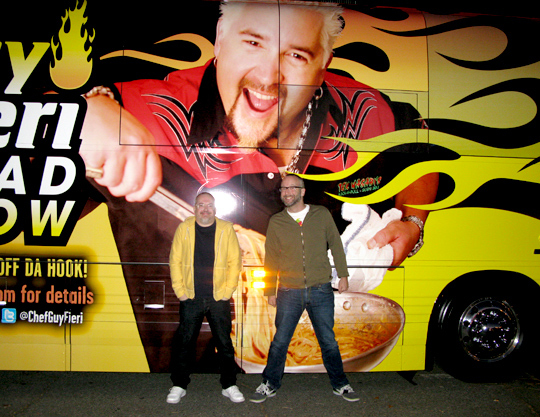 as it happens, "guy fieri's road show" is not really a very much of a show at all, just a very loosely connected series of highly rehearsed yet seemingly spontaneous events. if you like guy fieri, you'll love it. if you don't or have never heard of him (like the winner of the karaoke contest last night, oddly enough), you'll be either completely baffled or very pissed off or, perhaps, mildly amused. but pay $30 or more to see it? the bloopers from DDD were not that funny. What a rip off.